You know? i fall in love with face oil ever since i tried Josie Maran's Argan Oil (in the post here). It works so much better than my gel moisturizer. I can feel that my skin feels moisturized and not 'tight' and 'dry'. 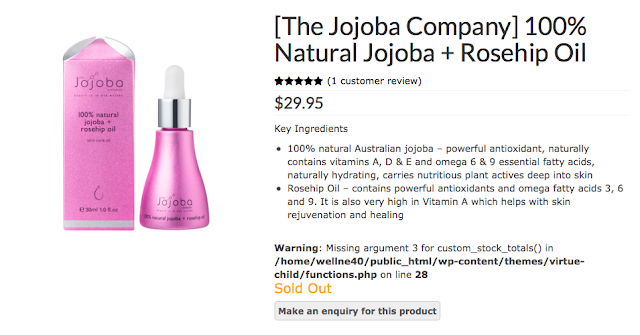 So i went on to search for other face oil, I know that Jojoba oil and rosehip oil are wonderful ingredients for the skin! Jojoba oil resembles our skin's sebum and thus it can 'trick' our skin into producing enough oil. But does that mean my face doesn't get oily anymore after applying this? Well this theory is not wrong but also not completely right. After applying it for a few hours, i can still see those little 'oil round drop' appearing on my nose and forehead. However it does makes my skin feels moisturized. Really much better than putting on gel moisturizer alone. The thing is... once i use water to wipe my face after my skin 'absorbs' the moisturizer, i can feel my skin getting tight again. So i think that gel moisturiser only works on the surface of the face? On the other hand, if i use water to wipe my face after putting on my face oil, my skin doesn't feel tight. So i suppose that the face oil can enter into the deeper layer of my skin. Hence i am hands down FACE OIL FREAK now! I have been using the Natural Jojoba oil + Rosehip oil from The Jojoba Company for about two months now. Comparing this to my Josie Maran Argan Oil, jojoba oil and rosehip oil absorbs much quicker than argan oil. Does this means that i don't love my argan oil anymore? No! I still love it but it really depends on my face's situation that day. Sometimes i feel like i need the argan oil, other times i feel like i need the jojoba oil. It depends on my mood too. haha. So far, i've been really loving this oil. The best way to use this is to put a few drops of oil into my gel moisturizer! THIS IS THE BEST WAY FOR ME TO USE. U really have to try it out yourself to feel the wonder haha. *So sorry it is currently out of stock from Wellness Within. 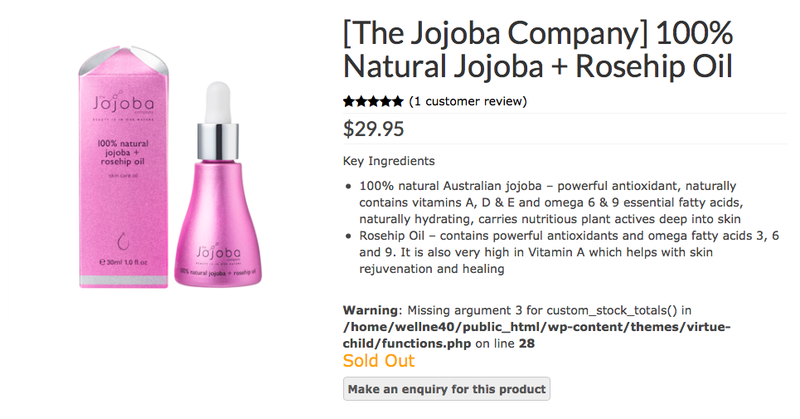 You may buy it directly from The Jojoba Company. Hello Kacey, thank you for the review on our product. We are happy that you love the oil as much as we do. Indeed, the price has been adjusted as the supplier has reviewed their prices as well. Do get in contact with us at hello@wellnesswithin.sg and we hope to hear from you again!